Golf grip aids are designed to be dual-purpose practice wrist and grip aids that come in all sizes for men and women. The gloves are meant to ingrain straight wrist when impact comes from hitting the ball as this promotes better ball contact. The palm side of the glove also features a handy fabric outline to show you how you should grip the club. Primarily designed by orthopedic hand surgeons and made up of top-grade cabretta leather ensures that you will get plenty of lifetime and value out of the product. These products also help players align their golf swing according to the best position on an open palm to provide maximum grip. Some players are born with a dominant side and that is what these hand exercisers try to improve upon. The best kind of grip is when it is both strong and firm and players will get an increased strength on weaker fingers which overcomes left or right side bias when playing on different sides of the green. Designed by an orthopedic hand surgeon that is also made of only the top-grade cabretta leather ensures that you will get plenty of lifetime and value out of the product. This product also helps players align their golf swing according to the best position on an open palm to provide maximum grip. The idea behind the Butch Harmon Right Grip gloves is that it uses Soft Bar Technology to give the golfer the perfect grip. 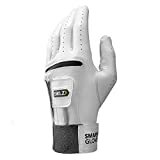 Equipped with a padded bar in both palms, the Right Grip gloves don't allow the club to rest too far up into the palms (a common fault with most handicap players). If you could choose only one grip training tool, this is it, Captains of Crush are the gold standard of grippers and are designed to give you the biggest gains in the shortest time. This is the gripper that changed the world as it took what had largely been a plastic plaything and turned it into a grip training tool that is serious, high-quality, and suitable for everyone from rank beginners to World's Strongest Man winners. Dynaflex Regular Pro strengthens your wrists, forearms, etc. Designed with a high performance rotor, which can reach speeds up to 13,000 rpm's and puts out 38 lbs. of torque, it aids in the prevention of repetitive strain injuries and carpel tunnel syndrome. It improves coordination while building strength!? Exclusive Digital FiberSof palm provides great grip and durability. FiberSof back creates consistent, comfortable fit. Breathable PowerNet mesh insert creates ventilated comfort. Designed with convenient Q Mark ballmarker on front tab. Proprietary Digital thumb provides feel, grip and durability. A good swing starts with a good grip. This tested product not only makes sure your hands are set in the perfect position but it's unique, proven weighting system helps groove your swing and improve your muscle memory, imperative for improving your game. Cheap and easy to use, the Golf Pride David Leadbetter Training Grip may look strange but it helps to mold the golf grip by use before a round. Helps golfers learn the mechanics and feel of proper hand placement through repetition and muscle memory. Grip Coach transfers to any club within seconds, easily and quickly, so golfers can switch clubs as they are practicing, ensuring a proper grip consistently from club to club. 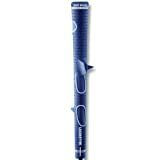 Grip Coach simply snaps onto the present club grip and guides the hands into exact placement in seconds, enhancing technique, resulting in lower and more consistent scores immediately! The award winning Grip Solid is worn over your glove to give you perfect grip pressure throughout your swing. The hands are your only contact with the golf club – If you’re holding the club wrong it’s nearly impossible to hit consistent golf shots. Grip Solid ensures your grip is perfect throughout your swing. If you’re holding the club too tight, your tempo is ruined. Some players are born with a dominant side and that is what this hand exerciser tries to improve upon. The best kind of grip is when it is both strong and firm and players will get an increased strength on weaker fingers which overcomes left or right side bias when playing on different sides of the green. Hank Haney knows hands are the most important part of every golf swing. It's your only contact with the golf club and determines to the greatest extent where your ball flies. In this exclusive DVD & Hand Exerciser set, Hank teaches you how to use your hands to improve your game and to develop the hand strength you need to play your best golf. 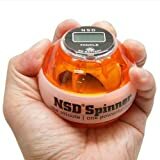 Our NSD Power Essential Spinners are the most affordable gyroscopic hand, wrist, and forearm exercisers we have. The Essential Spinner is a great way to get started with your hand, wrist, and forearm training. The small form factor means you can take it with you just about anywhere. Comes in a stylish hard plastic shell with ergonomic soft rubber grip. Ruff Grip Callus Builder Caps attach easily to the Ruff Rider Gripmaster Exercise Tool. Very secure fit on the Gripmaster. Used with the light tension Gripmaster it was painful for the first few days, but I had noticeable calluses after two weeks and now after one month, they're quite significant. Removable weights to simulate both woods and irons help you warm-up, stretch out, and build golf-specific muscles without having to pull out your clubs. The molded training grip provides ideal hand placement and position to produce the correct golf grip, while two weight adjustments allow you to simulate iron and wood practice. 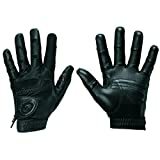 This glove is designed to be a dual-purpose wrist and grip guide that comes in all sizes for men and women. The glove is meant to ingrain straight wrist when impact comes from hitting the ball as this promotes better ball contact. The palm side of the glove also features a handy fabric outline to show you how you should grip the club. Combines the essentials of a proper grip and the feel of a full motion swing. Great for a complete warm-up. Helps build golf muscles. Improves a golfer's swing plane. Practice your swing anywhere. The Perfect Grip fits like a 'second skin' over your regular golf clubs. It lets you experience how it actually feels when you hit a ball using precisely the same grip techniques as the world's best professionals. And the unique T-TracTM locking system (pat. pending) provides a rock solid fit to any club in the bag and is guaranteed not to shift during practice. Thumb Caddy is a small device that fits around the grip of a golf club and is designed to help the golfer learn the proper grip. Made of rubber-coated plastic, the Thumb Caddy can be carried in your pocket. When ready for use, the golfer snaps it onto his golf club grip, aligns it, and takes his grip with the thumb of his lead (top) hand resting in the Thumb Caddy. Hand Grips feature double coiled chromed steel springs with durable molded plastic handles. Double coiled chromed steel springs. Durable molded plastic handles. Comes in a pair. Strengthen your hands, fingers and forearms while testing your resolve with this challenging exercise. ZoN Resistance Hand Grips hand grips build finger, hand, and forearm strength. They are ideal for developing strength and stamina safely, efficiently and effectively while reducing stress at the same time. And you can use them practically anywhere. With a push of the button the new Docking Station activates the gyroscopic Pro gyro. As speeds build resistances grows, this powerhouse reaches up to 9,000 RPM with 25lbs of torque resistance. This package combines our enrty level Pro gyro with the amazing Docking Station. Packed full of our features, including the advanced battery-free digital speedometer (SM-02), the embedded LED light that's powered by your hand, and a military-grade, impact resistant shell in stylish amber. Comes with a clear, comfortable and ergonomic rubber grip, impress your friends with a beautiful lightshow and then show them how FAST you can spin the NSD Spinner! All Fusion Series Spinner are tested to be vibration free at up to 15,000 RPM. On top of that, there are two pieces of Reversible inner tracks inside. When you feel it wears out after long period of time of use, you may take off the rubber band, unscrew the shells, clean the inner tracks with water ONLY and then flip the tracks over to make the Spinner as good as new. You may also purchase additional spare parts to make another 2X lifespan. Butch Harmon Right Grip Golf Gloves ~ RIGHT Handed -M/L Medium-Large! Picture for reference only. Ship out 2-7 days. Wrist and Grip Guide. One of the keys to great ball striking is a firm left wrist at impact. 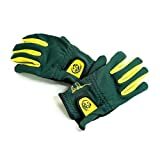 The Smart Glove, with removable wrist guide, sets your wrist in the correct position through the swing with a proper release. 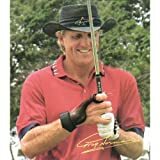 The Greg Norman Secret automatically places your hands in the correct position and holds them there thoughout the swing - Automatically. Keeps the right wrist in the correct bent position at impact allowing crisp, long and boring shots. David Leadbetter's Training Grip, created in partnership with Golf Pride is the easiest and most effective way to learn how to grip a club correctly. Works great for any skill level. Spinner has never been more fun. 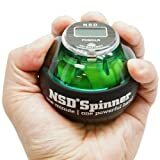 The NSD Winner’s Spinner comes with a Battery-free and auto power-on LCD counter (SM-02) that gives you vital information on your Spinner exercise routine. Know the current total revolutions, Speed in RPM, or have some fun and see what's the maximum RPM you can achieve on your Spinner. All Winner’s Spinner are tested to be vibration free at up to 15,000 RPM. The Bionic Golf Glove is unlike traditional golf gloves because it helps regain club control. With innovative features based on anatomy, the Bionic Glove combats hand characteristics that interfere with game play. Valeo fitness products helps to improve cardiovascular conditioning and strength during workouts. Every Valeo fintess product can be used at home or at the gym, and many are easy to take along when you are on the road. You deserve that beer after a long day of golfing.